Beyond the urban sprawl of Greater Manchester, Alderley Edge is the first piece of true countryside one comes across as one travels south. Despite the developments of recent years, it has retained its village atmosphere. 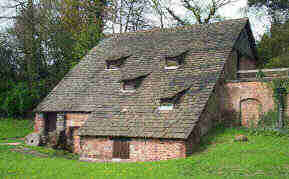 A mile or so further south, Nether Alderley has remained a rural hamlet with a long, recorded history. First written evidence of Alderley Edge, then known as 'Chorlegh' appeared in the 13th century. It comprised estates that had many different owners during the middle ages but since the 15th century, most of them have belonged to the de Trafford family. Until the mid 19th century it was a quiet, mainly agricultural area consisting of several cottages, a blacksmith's and the Dc Trafford Arms which still exists at the southern end of the village. The coming of the railway changed all this. The Manchester and Birmingham Railway built a line out to Alderley, offering free season tickets for 20 years to Manchester businessmen who built houses with a rateable value of more than ?50 within a mile of the station. This 'season ticket' was in the form of a small silver oval which could be worn on a watch chain. Eager to move away from the smoke of the city, this led many families to build fine mansions and villas, particularly on the slopes of the Edge. Known as 'the Cottentots' because of their connections with the cotton trade, their homes still exist although many being too big to manage today, have been divided up. 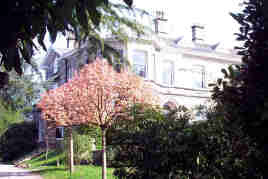 The houses on the Edge, with their walks and trees, were designated as one of the first conservation areas in the North West. It was because of the railway, too, that Alderley Edge got its name. The railway company did not want its station called Chorley because of the possible confusion with Chorley in Lancashire. So, looking at the sandstone escarpment already known as The Edge, they named it Alderley Edge - against much opposition! Because of the railway, Alderley became a popular place to visit and the railway company popularised day trips and cheap excursions to the village. This period also saw the appearance of buildings which are now landmarks. 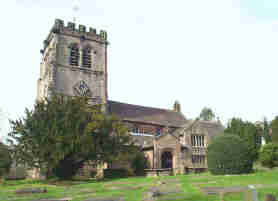 St Philip's Church with its 175ft spire was built in 1853 and the village school a year later whilst Alderley Edge High School (now St Hilary?s) opened in 1876. The Mission Hall (later known as The Institute) was built as a temperance hall for the recreation of the 'lower classes' by the wealthier residents in 1878. The Methodist Church in Chapel Road was built ten years after St Philip's. In the streets tucked away behind the village is the Festival Hall. Alderley Edge has played host to an annual musical festival since 1911 and by the 1920s it became so popular that local residents were encouraged to subscribe towards a hall in which to hold it. In 1928, the Festival Hall in Talbot Road was used for the first time. Each May it is the main venue for the Festival one of the most successful in the country. 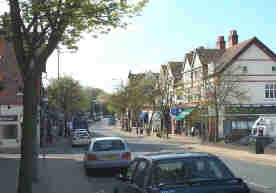 Alderley has remained a popular and prosperous village with individual shops, cafes and restaurants and continues to be a sought after location for residents and visitors alike. Over Alderley with its beautiful farmland, rolling fields and superb views is the largest of the three parishes yet has the smallest population. Part of Over Alderley nestles on top of the Edge and from here the walker can see as far as the Welsh Hills. Read Alan Garner's famous children's novel, 'The Weirdstone of Brisingamen' which is based on the Edge, and you'll find yourself believing that many of the magical adventures took place in this lovely part of Cheshire. Just across the A34 from Nether Alderley Mill is a black and white timbered house - now a private home that was once a coaching inn. Still called The Eagle and Child, it was named after the crest of the Stanley family. Along the adjoining lane, hidden from the main road, is the lovely 14th century St Mary's Church. One of its most interesting features is the Jacobean Stanley pew. Situated high up on the wall of the church, it is only accessible from outside and enabled the Stanley family to worship without being watched by the prying eyes of the villagers! Decorated with the coats of arms of the various families the Stanleys married into, the pew is unique in Cheshire and one of the finest of its type in the UK. By the churchyard, which, in the early 19th century, was a notorious haunt of grave robbers who sold bodies to Manchester University, are a collection of buildings which, like the church, are built in local sandstone. These are the Old Schoolhouse, built in 1628, together with a l9th century addition - which has since become the Village Hall - and the Stanley family mausoleum. Tucked away in the lanes of Nether Alderley are some beautifully restored farmhouses and cottages, some daring back to the l6th century. Many of the smaller cottages are believed to have been miners' homes in the 17th century and Welsh Row is thought to have been named after Welsh workers who came to the area to work in the copper mines.